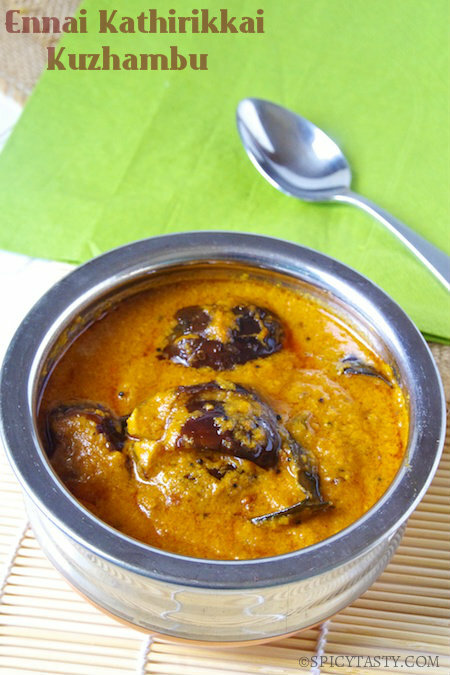 Ennai Kathirikkai Kuzhambu is an authentic South Indian dish made with fried eggplant cooked in a spicy curry. 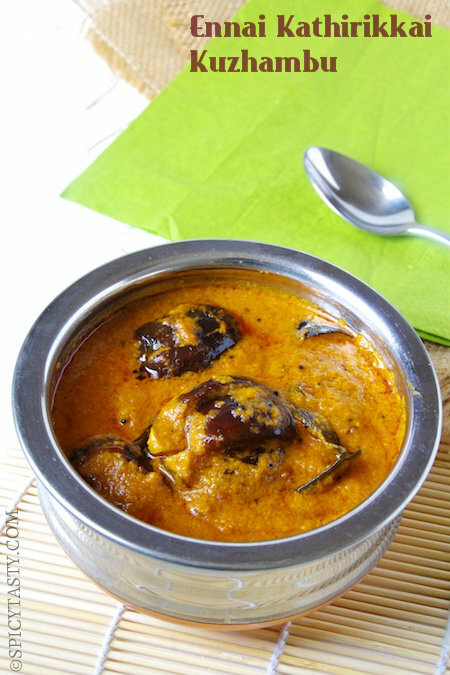 You can serve it with rice and roti, also with dosa or idli. It is a comfort food and my family’s favorite. Try to use small eggplants for this dish. This dish requires a lot of oil and I generally don’t want to compromise on the taste when it comes to authentic dishes. But I try to make it not very often. You can also reduce the amount of oil accordingly. Soak tamarind in hot water. Extract the juice and discard any pith. Heat a pan and add a teaspoon of oil. Add coriander seeds, dried chilies, black pepper, chana dal, toor dal. Let it cool and grind it along with tamarind to a fine paste. Masala paste is ready. Wash the eggplants, wipe it dry. Remove the stem and cut it like a flower keeping the bottom portion intact. Heat 1/3 cup of sesame oil and fry the eggplants until it becomes tender. Reserve the used oil. Heat 2 tsp of oil in a pan and saute onions until translucent. Remove from heat. In the same pan, heat 1 tsp of oil and saute grated coconut for a minute and remove from the pan. Add a tbsp of oil to the same pan and saute chopped tomatoes until cooked. Let everything cool and grind it to a fine paste. Heat 1/4 cup of vegetable oil and add mustard seeds. When it splutters add cumin seeds, fenugreek, asafoetida, chopped garlic and curry leaves. Saute until garlic becomes golden color. Add sambar powder and cook for a minute. Add ground onion tomato mixture along with the masala paste. Bring it to a boil, reduce heat and cook for 15 minutes. Add fried eggplants along with the oil used for frying. Add a cup of water and let everything cook over low heat for another 15 minutes or until oil starts separating from the gravy. Ennai Kathirikkai Kuzhambu is ready. Serve hot with rice and appalam or vegetable stir fry. 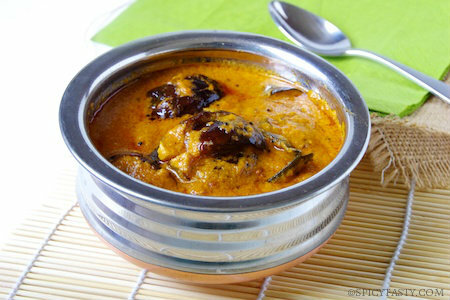 I like South Indian dishes but this recipe is unique in nature. I tried this today. Tasted awesome. Really good recipe. Thanks. Hi, in the ingredient list, coconut is not given. so, could you plz tell how much coconut is required?